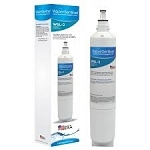 The Water Sentinel WSM-2 refrigerator filter is designed to provide up to six months of life or 300 gallons. The Water Sentinel WSM-2 water filter should not be used with water that is microbiologically unsafe or of unknown quality, without adequate disinfection before and/or after the filter. Q: My old filter has a flat bottom - will this fit? A: yes and it works just like the original. Q: Is this the same filter as the 7023811? A: Worked for me; no problem. Q: do they work just like the old ones? A: From what I can tell they work just fine. Water seems to taste good. Q: What is filtering/performance comparison with Maytag UKF8001? Q: Where is this filter made?